Tablets and other mobile computing devices are part of everyday life, but using them can be difficult for people with paralysis. New research from the BrainGate consortium shows that a brain-computer interface (BCI) can enable people with paralysis to directly operate an off-the-shelf tablet device just by thinking about making cursor movements and clicks. 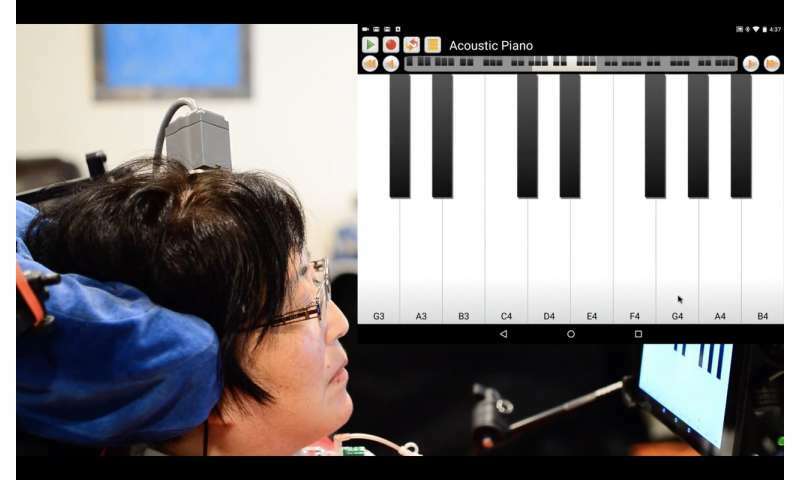 In a study published November 21 in PLOS ONE, three clinical trial participants with tetraplegia, each of whom was using the investigational BrainGate BCI that records neural activity directly from a small sensor placed in the motor cortex, were able to navigate through commonly used tablet programs, including email, chat, music-streaming and video-sharing apps. The participants messaged with family, friends, members of the research team and their fellow participants. They surfed the web, checked the weather and shopped online. One participant, a musician, played a snippet of Beethoven's "Ode to Joy" on a digital piano interface. "For years, the BrainGate collaboration has been working to develop the neuroscience and neuroengineering know-how to enable people who have lost motor abilities to control external devices just by thinking about the movement of their own arm or hand," said Dr. Jaimie Henderson, a senior author of the paper and a Stanford University neurosurgeon. "In this study, we've harnessed that know-how to restore people's ability to control the exact same everyday technologies they were using before the onset of their illnesses. It was wonderful to see the participants express themselves or just find a song they want to hear." The investigational BrainGate BCI includes a baby aspirin-sized implant that detects the signals associated with intended movements produced in the brain's motor cortex. Those signals are then decoded and routed to external devices. BrainGate researchers and other groups using similar technologies have shown that the device can enable people to move robotic arms or to regain control of their own limbs, despite having lost motor abilities from illness or injury. This study from the collaboration includes scientists, engineers and physicians from Brown University's Carney Institute for Brain Science, the Providence Veterans Affairs Medical Center (PVAMC), Massachusetts General Hospital (MGH) and Stanford University. The participants reported finding the interface intuitive and fun to use, the study noted. One said, "It felt more natural than the times I remember using a mouse." Another reported having "more control over this than what I normally use." "It was great to see our participants make their way through the tasks we asked them to perform, but the most gratifying and fun part of the study was when they just did what they wanted to do—using the apps that they liked for shopping, watching videos or just chatting with friends," said lead author Dr. Paul Nuyujukian, a bioengineer at Stanford. "One of the participants told us at the beginning of the trial that one of the things she really wanted to do was play music again. So to see her play on a digital keyboard was fantastic." "The assistive technologies that are available today, while they're important and useful, are all inherently limited in terms of either the speed of use they enable, or the flexibility of the interface," said Krishna Shenoy, a senior author of the paper and an electrical engineer and neuroscientist at Stanford University and Howard Hughes Medical Institute. "That's largely because of the limited input signals that are available. 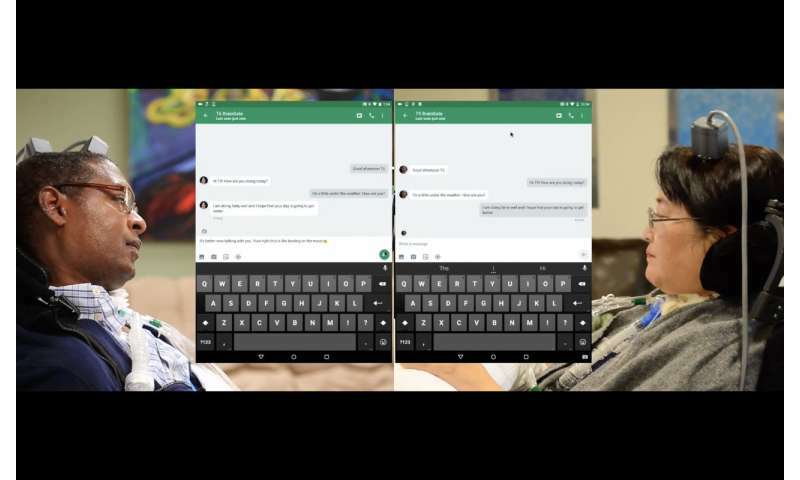 With the richness of the input from the BCI, we were able to just buy two tablets on Amazon, turn on Bluetooth and the participants could use them with our investigational BrainGate system right out of the box." 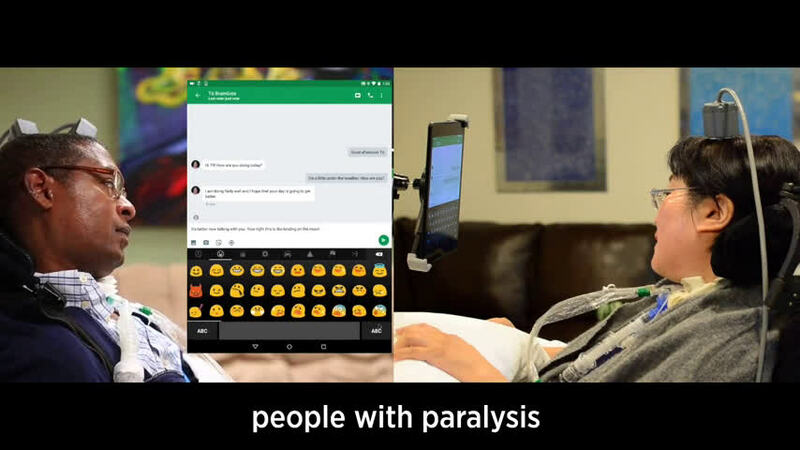 "This has great potential for restoring reliable, rapid and rich communication for somebody with locked-in syndrome who is unable to speak," said Jose Albites Sanabria, who performed this research as a graduate student in biomedical engineering at Brown University. "That not only could provide increased interaction with their family and friends, but can provide a conduit for more thoroughly describing ongoing health issues with caregivers." "When I see somebody in the neuro-intensive care unit who has had an acute stroke and has lost the ability to move or communicate, I'd like to be able to say, 'I'm very sorry this has happened, but we can restore your ability to use the technologies you were using before this happened, and you'll be able to use them again tomorrow,'" Hochberg said. "And we are getting closer to being able to tell someone who has been diagnosed with ALS, 'even while we continue to seek out a cure, you will never lose the ability to communicate.' This work is a step toward those goals."